If you want to know how to sell newspaper advertising to retail businesses, you should start by looking at what may appear to be its drawbacks. Critics may say newspaper advertising doesn't have the interaction of online media, the sizzle of television commercials or the low cost of radio ads. Still, for many businesses, newspaper advertising is the most effective way of finding customers. 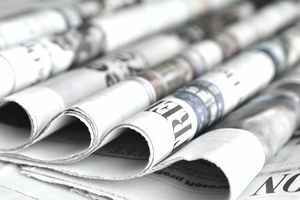 If you work for a newspaper, make sure you know how to sell the advantages of newspaper advertising, so you don't lose business to your on-air or online competitors. Check out a car dealership's TV commercial. In 30 seconds, there's only time to gloss over the details of a closeout sale and have enough time to tell viewers where to find the car lot. On the radio, you can't even see the cars. That's why newspaper advertising can boost floor traffic for any business. A full-page ad can show off all the cars, with prices and finance rates, and include a map to the dealership. A reader can study the ad without having the typical TV commercial announcer yelling at her to buy now before it's too late. You can sell the client on choosing the correct type of newspaper ad to meet his needs and his budget. If that same client goes to a TV or radio station, his only choices are likely a :10, :15 or :30 spot. With newspaper advertising, they can study the rate card to choose to advertise just his logo, address, and phone number, or a full-color ad that can highlight his entire inventory. For businesses new to advertising, buying a print ad is a more low-key decision than trying to decide how to produce a complicated, expensive TV commercial. Use that advantage to calm nerves and get the deal signed. The couponing craze makes a compelling argument for you to sell newspaper advertising to a reluctant business owner. Many businesses yearn for an increase in floor traffic. Putting a coupon into a print ad is an ideal way for them to get more people through their doors. TV or radio commercials may say, "Mention this ad for 5% off", but that's likely not the sure-fire traffic booster as having a printed coupon that gets into the customer's hand. Plus, a business has an easier time managing expiration dates with a print ad than in the fine print that flies by in a TV commercial. A possible side benefit to your newspaper is that a great coupon promotion might actually boost newsstand sales. A great offer of $20 off a pair of jeans might have some people buying two, five or more papers just to get the coupons. The biggest obstacle to any form of advertising is having the audience tune out the message. With radio, a listener may switch stations when the commercials come on. With television, a commercial break becomes a potty break. But even a casual newspaper reader will flip the pages and scan them. Provided that you can create eye-catching newspaper advertisements, you can get your client noticed. True, there are some places in a newspaper that are more desirable than others. But a client can definitely get noticed through a newspaper insert. When a reader pulls out the inserts from the middle of the newspaper, her hands will be on the ad and she can't help but glance at it, especially if it is in color. Newspaper advertisements may not be as flashy as their counterparts online or on radio or television, but for clients interested in a cost-effective, no-frills approach to boosting their sales, even black-and-white images can put green into their cash registers. It's your job to convince them.